A team of jihadists raided a school for midwives in Jalalabad, Afghanistan yesterday. The terrorists were finally subdued after several hours by security personnel, who took great care to limit civilian casualties. The Islamic State’s Amaq News Agency issued a statement claiming responsibility for the attack earlier today. 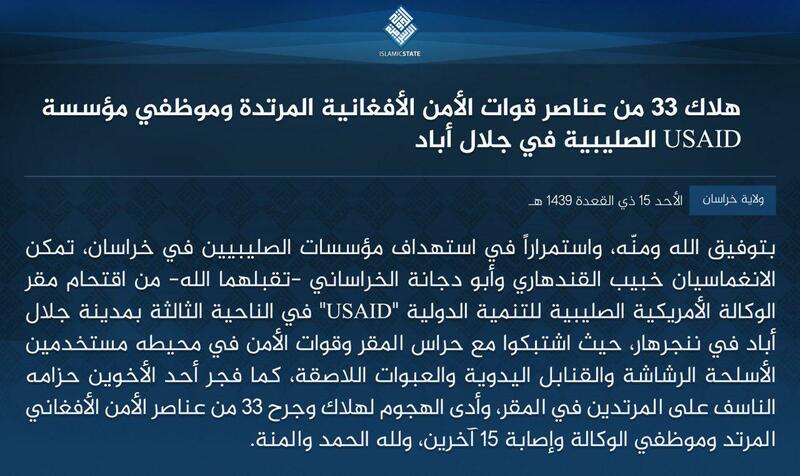 Amaq’s account says the terrorists were inghimasis, or well-trained guerrilla fighters who immerse themselves in battle before blowing themselves up, and that their target was the “headquarters of the United States Agency for International Development” (USAID) in the city of Jalalabad. Amaq states that the attack began when an explosive device was detonated at the gate in front of the building, leading to a gun battle between the assailants and the building’s guards, who were reinforced by other Afghan security forces. Amaq claims that 33 people from the Afghan security forces and workers were killed, while 15 others were wounded. However, this claimed casualty toll is far higher than that offered in various media accounts, which say that two to three people were killed. The Islamic State followed up Amaq’s report with another statement on the assault, repeating the same casualty figure. The Taliban, which is more concerned with how its violence is perceived, quickly denied any responsibility for the raid. The official Twitter account for Taliban spokesman Zabihullah Mujahid issued a short disavowal hours before Amaq’s message was posted online. The US has led a focused counterterrorism mission to dislodge the Islamic State from its territory in eastern Afghanistan, but the group retains a significant operational network in the area. Civilian facilities, such as the school for midwives, are also easy targets that do not require sophisticated planning. As of early 2016, the Islamic State’s Wilayah Khorasan (or Khorasan “province”) maintained a safe haven of approximately nine districts in Nangarhar. By the end of 2016, according to the US military, this had been reduced to just three districts. It is not clear how much ground Abu Bakr al-Baghdadi’s loyalists control in Nangarhar today, but they regularly launch attacks in the province. The US has continued to hunt Wilayah Khorasan’s leaders and members, dropping a GBU-43 Massive Ordnance Air Blast bomb, or MOAB (better known as the “Mother of all Bombs”), on an Islamic State tunnel complex in the Achin district of Nangarhar in Apr. 2017. In addition to attacking the Afghan government and civilians, Wilayah Khorasan has also battled its Taliban rivala in Nangarhar for years. Some of the clashes have taken place in the Tora Bora Mountains, which were once home to Osama bin Laden and al Qaeda. In recent weeks, the Islamic State’s men have targeted the Taliban in Nangarhar, as well as in the northern Jowzjan province. Amaq claimed additional Taliban casualties yesterday in Jowzjan, saying that 25 Taliban members were killed or wounded in a clash. Thomas Joscelyn :Thomas Joscelyn is a Senior Fellow at the Foundation for Defense of Democracies and the Senior Editor for FDD's Long War Journal.